In visiting with La Harpe Mayor Kenny Brown, there are a couple of things you will want to be sure you do Saturday at the 9th Annual Fred Gibb Memorial Car Show in La Harpe. First, make sure you arrive in time for the opening ceremonies at 10:00 a.m. at the football bleachers. You will not only see pretty amazing things from the ground, but you will also be dazzled from the air. Second, be sure you bring a child along. Each "kid" age 15 and under who is accompanied by an adult, will receive a ticket for a drawing of a red remote control 1969 Camaro. The car is pretty impressive, as it is fixed up with Fred Gibb decals. The car, before stickers, is valued over $150 and is strictly a prize to be given away to a youth who is lucky enough to have a thoughtful adult bring him/her to La Harpe to the car show. Third, bring your camera. It is free and always a great family time of seeing some amazing vehicles, some amazing people, and a chance to visit about how it use to be in the earlier years or 50s and 60s. Brown, Mayor of La Harpe and co-chair for the show, said entries will be rolling into La Harpe before 8 a.m. with opening ceremonies taking place at the football field bleachers. Rev. Bruce Goettsche, pastor of the Union Church, will open the event with the invocation followed by the firing of a Hosier Cannon by the National Guard 123rd Field Artillery and presentation of the colors. As Melissa Burt sings the National Anthem, Steve Beaver will fly over dropping a parachuter who will land in the middle of the football field in front of the crowd. Then Retired USAF Dennis Morton, will circle the area in his "Red Baron" biplane, weather permitting. This year the Fred Gibb race cars featured are that of Fox-Ward and the Fox & Wright, pictured on this year's shirt along with Helen Gibb's Nova #50, the last COPO Nova made. Five huge tents will display the Gibb Super cars that attend the show including Dale Earnhardt's #8 NASCAR purchased by Matt Murphy of Georgia. A new tent was purchased this year with memorial funds of Don Hallowell, who had a car in the show. The 20x30 foot tent will have a banner prepared by Murray Mershon. People will be able to get good food from any of four vendors surrounding the tent and then go inside to eat, sit, and visit. Anyone in the La Harpe area can use this tent throughout the year for personal functions in his memory. Two tents will house the registration and the many plaques and trophies. The third will house Mrs. Helen Gibb's and other Gibb cars, and the 4th and 5th tent will house specialty and display cars. Lee Ward of Blandinsville donated a white Fred Gibb jacket for auction that never has been worn, and is still in a plastic bag with tags. Brown said the first car show nine years ago was held to honor the 50th year of the Camaro and Fred Gibb. What he thought would be a small show of maybe 40 around the La Harpe City park ended up to be 100 and was moved to the La Harpe Park District's golf course. It was such a success it was moved to an annual event with as many as 540 exhibiting and thousands attending from all coast to coast. "I think more cars will come this year than last," Brown said of the $3.00 gas prices. "Last year I think it surprised people, this year they are use to it. One guy called from Texas and said "We're coming. We're just going to bring our own lunch and not stop at Hardees," he joked. Brown said the many volunteers has grown from 8-10 who helped to 54 volunteers helping today. Volunteers receive special staff t-shirts, this year's is light blue. At the gate younger kids are given matchbox cars and all who enter receive "goodie bags" and adults receive tickets for a give-away drawing. Brown said the people keep coming back and tell them they really felt welcome. Those helping Brown on this year's show is Bob Lionberger, Jerry Burford, Nancy Gibb, and Darrell Kraft. "We all do a little and it all comes together," Brown said. "There are many veterans who take part in this car show," Brown said as he explained why special attention was given to a patriotic opening ceremony. "A lot of them are from the Vietnam generation. They served either in the war or in the service,"
"After 9-11 and as bad as I hate terrorism, it really brought the country together and helped Americans understand about our flag and what Veterans have done. "We're proud to be Americans," and the classic cars basically are all American." 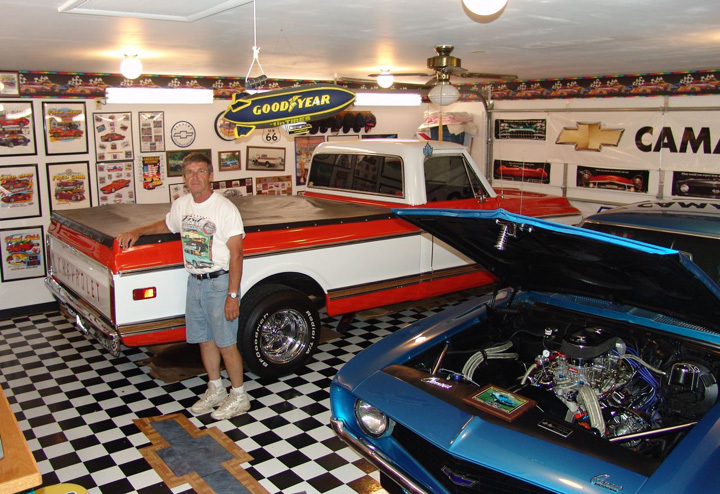 Car enthusiast and organizer of the Fred Gibb Memorial Car Show, Ken Brown may have the fanciest garage in La Harpe as he converted it into a classic place for all his Fred Gibb car show and Chevrolet memorabilia. Brown's 1969 Camaro and 1972 Chevy Custom 1/2 ton truck are two of approximately 500 vehicles that will be on display at the annual memorial show. The event follows Friday's Maple City Cruise night in Monmouth 6-10.